This week, in an attempt to avoid any substantive work, I have been playing around with the Ordnance Survey’s Digital Terrain Models (DTM) that are available for free as part of their OpenData archive to anybody who wishes to use them. The spur for this was the launch in July of a new DTM onto the OpenData site. Previously (and still today), the OS made available a dataset known as PANORAMA. This was created using contour data surveyed in the 1970s. 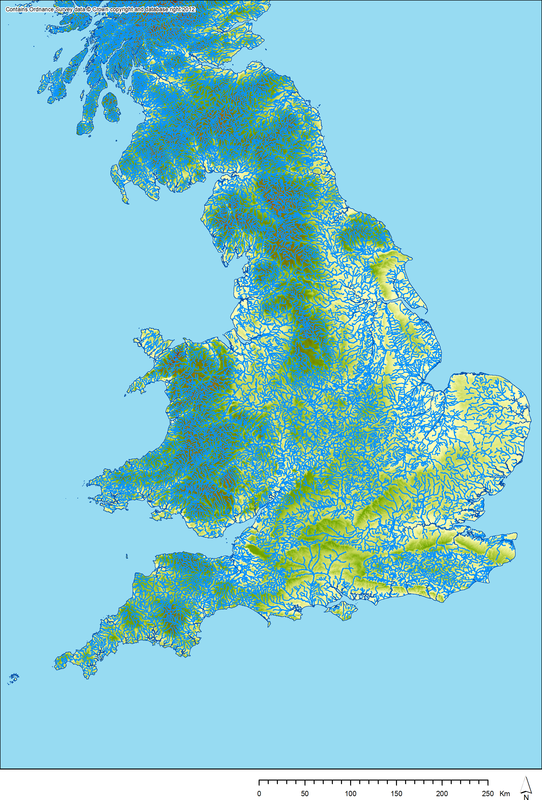 In order to turn this into a rasterised DTM, some interpolation algorithm (I don’t know which) was used to estimate elevation values between contours to result in a continuous field (50m by 50m pixels) of elevation values for all of the UK. The heights in PANORAMA are recorded as integers, i.e. to the nearest whole metre. In July, the OS released a new product, known as Terrain 50. This DTM was created using LiDAR data surveyed from the air and then averaged out to 50m by 50m grid cells. A lot of data processing goes into turning raw LiDAR data into a terrain model, but this all takes place behind the scenes, so it is difficult to know exactly what has been done. The heights in Terrain 50 are recorded as floating point numbers, so apparently convey more precision than PANORAMA. However, due to the relatively coarse nature of the grid used (50m by 50m pixels), this does carry a degree of spurious accuracy (as we are inevitably dealing with averages). 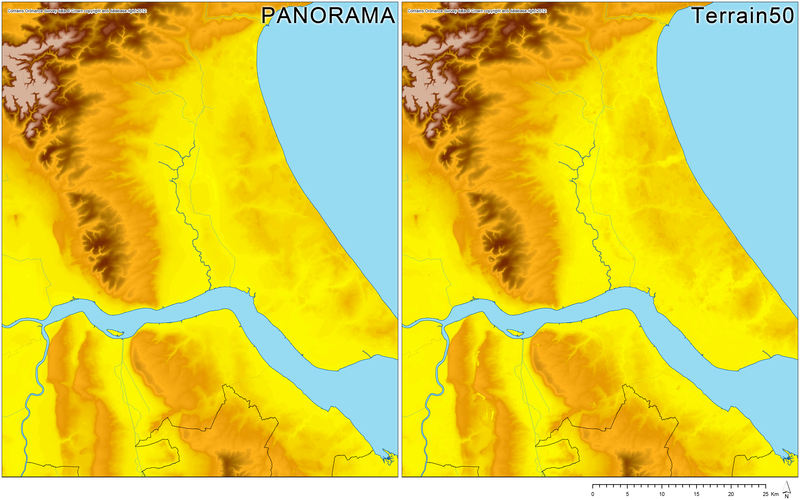 Comparison of PANORAMA and Terrain 50 DTMs for an area of East Yorkshire / Humber. 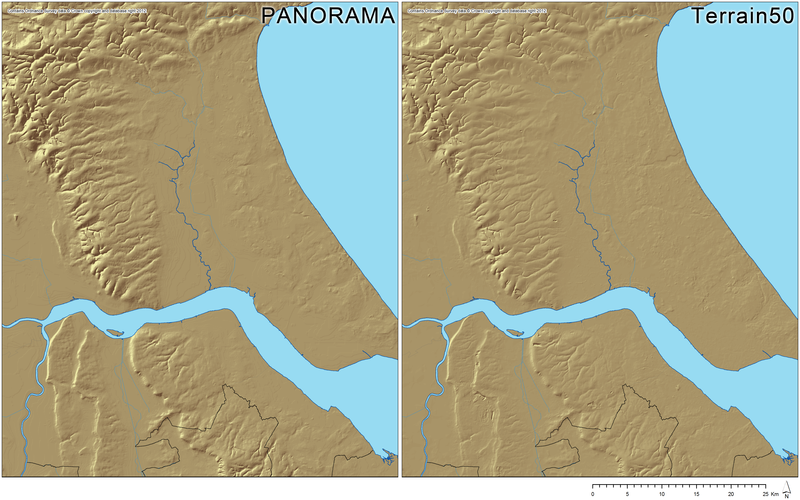 Comparison (hillshade) of PANORAMA and Terrain 50 DTMs for an area of East Yorkshire / Humber. The contour origin and whole number data model of PANORAMA produces a stepped plateau appearance, being especially apparent in areas of gradual change in elevation. PANORAMA produces a substantially smoother picture of change in elevation over space. Terrain 50 appears much more accurate, but also “noisy”. Human impacts on the landscape (e.g. quarrying) show up much more obviously in Terrain 50. On the face of it, Terrain 50 looks a much more accurate representation of the terrain of the UK and, as such, would likely be most peoples’ first choice when choosing between these two DTMs. As I have so far been working with the PANORAMA DTM, I wanted to test how different it was from Terrain 50 in order to see if I should go back and rerun some of my analyses with the newer product. The simplest way to do this is to compare the elevation values recorded in each product for the same piece of terrain, i.e. subtract one grid from the other in the Raster Calculator in ArcGIS and then calculate some basis statistics on the result. However, this is complicated somewhat by the fact that the two grids are not aligned directly on top of each other: the origin of a pixel in one is in the middle of a pixel in the other, i.e. they are offset by 25m east / west and 25m north / south. To enable a direct comparison to be made, I reprocessed the PANORAMA DTM to split each cell into four and then aggregated sets of four cells (using the mean) on the same alignment as Terrain 50. This will have resulted in some smoothing of the resulting surface, I expect, but hopefully not to the extent of making the comparison invalid (as PANORAMA already possessed a relatively smooth surface). Difference between PANORAMA and Terrain 50 cells. Differences between the two DTMs are greatest in upland areas. This will at least partly be due to the need to draw contours legibly forcing cartographers to underplay the steepness of very steep slopes. The sea tiles are quite interesting in the way they vary. This seems to be due to PANORAMA using a single value for sea cells across the whole dataset, whereas Terrain 50 seems to use a single value for sea cells on each 10km by 10km tile, but different values between tiles. We can also see some differences being much greater on one side or other of the division between tiles aligning with 1000m divisions on the OS grid. This must be due to Terrain 50 data being processed on a tile by tile basis, more on which later. Histogram of elevation difference between PANORAMA and Terrain 50. From this graph, we can see that although there are cells with differences of up to nearly 230m, the vast majority of cells are within 5m of elevation of their counterpart. The mean difference is 1.91m and the standard deviation 2.26m; 75% of all values are within 2.5m of their counterpart. As such, PANORAMA and Terrain 50 are actually very similar in elevations recorded. Difference in elevation between PANORAMA and Terrain 50 for an area of Somerset (black = no difference, white = high difference). Difference in elevation between PANORAMA and Terrain 50 for an area of Somerset (black = no difference, white = high difference). Features annotated. The motorway is clearly a feature that appears in Terrain 50 but not PANORAMA. The contour lines are clearly an artifact of the origins of PANORAMA. The reservoir is presumably a similar issue to the sea level variation. The variation on the Mendips is presumably due to the “noisier” more precise nature of Terrain 50 contrasting against the smoothed appearance of PANORAMA. The appearance of the grid lines worries me somewhat though. They were not apparent (to my eye) when looking at the raw data or hillshade layers for either dataset, so presumably they are the result of quite a subtle effect. 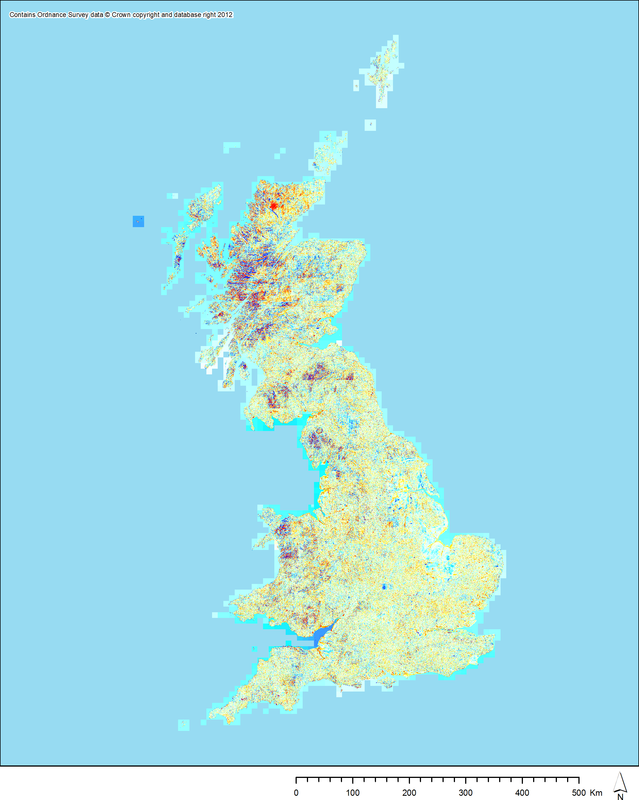 My assumption (as mentioned above) is that these arise from the LiDAR data behind Terrain 50 being processed as a series of tiles rather than as a single dataset: this is of course inevitable as a continuous high resolution LiDAR dataset for all of the UK would be mind bogglingly immense. My fear is that any sensitive analyses of terrain using Terrain 50 might show up these grid edges in their results. 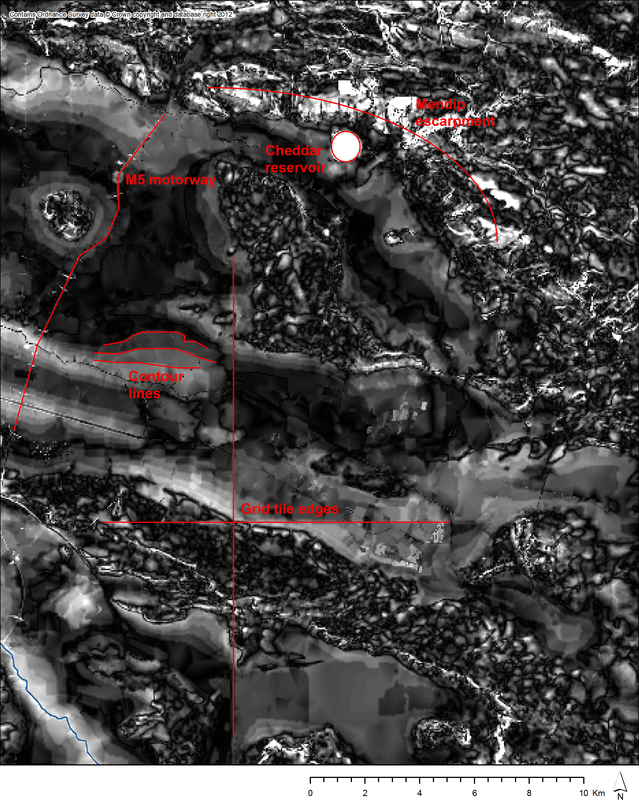 However, this is even more true of the 1m contour “cliff edges” that appear in PANORAMA. At least grid lines will be obvious to the human eye if they do cause strange effects. So, what does this all mean? 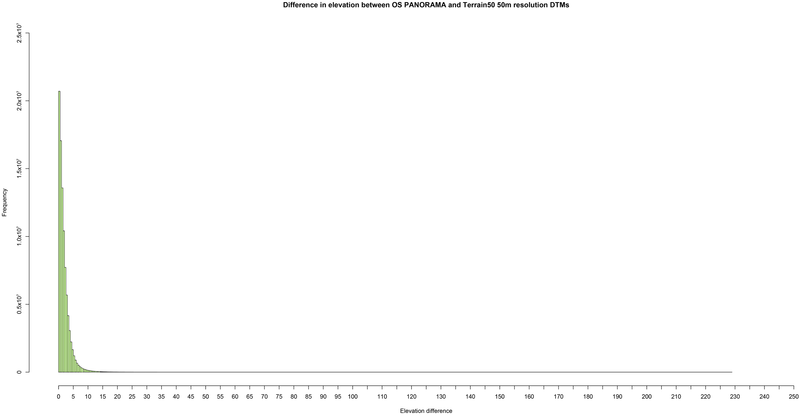 Well, I would argue that the generally minimal difference between elevations recorded for the same place in the two datasets means that previous analyses (especially coarse analyses) undertaken using PANORAMA should not be considered invalidated by the (presumably) more accurate new Terrain 50 DTM. Also, the “noisy” nature of Terrain 50 and the presence therein of more features of human origin might mean that the smoother PANORAMA could still be the best choice of DTM for certain applications (especially in archaeology, where features like the M5 would not generally be a useful inclusion). I recently attended a Workshop on Challenges in Geo-spatial Visualization run by the OeRC at Pembroke College, here in Oxford. The workshop was organised by Prof Min Chen and his colleagues in order to consider challenging problems in the visual analytics of spatial data and to discuss potential solutions. Jason Dykes and Jo Wood of the giCentre at City University London presented particularly interesting ideas and visualizations, based around cartograms and visualising spatial ‘flows’. They also emphasised the critical element of visual salience: this is the concept that (spatially) large objects tend to dominate on a map, whereas (interpretatively) important objects ought to be what our attention is drawn to. I was also particularly taken with the ideas Simon Walton (of the OeRC) in regard to the importance of spatial frequency to visual perception (e.g. if we look at a Google Earth image of a city from space, we arguably tend to think that we distinguish between city and countryside based upon colour [i.e. greens vs greys], but we are in fact more influenced in this regard by the complexity of what we are seeing, with countryside being quite plain and cities complex). Overall, the workshop was very engaging and challenged my thinking on how I might approach the spatial analysis of EngLaId’s datasets. In particular, I think I am rather too wedded to the conventional map and, as such, have been experimenting with some alternative visualizations since the workshop. One idea raised in discussion by Jo Wood was that of making graphs where one axis represents space (in some way) and the other an attribute associated with data located within that space. 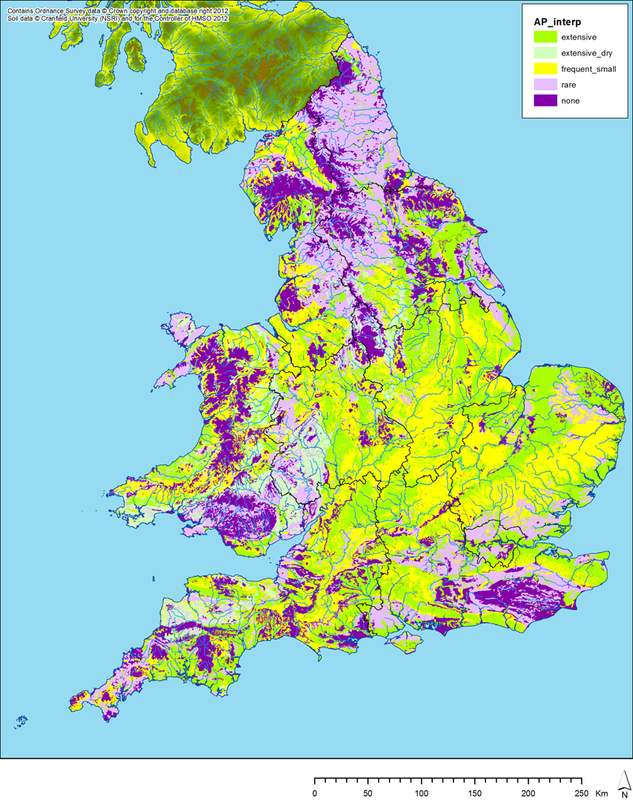 It occurred to me that one common concept seen in much archaeological interpretation on the scale of England / Britain was that of difference between the lowland zone of southeastern England and the highlands of the west and north. Conceptually, we can thus think of this as a trend from south east to north west. Euclidean distance raster from point marked by X. 10km distance bands from point marked by X. It is then possible to use this banding to plot other attributes recorded in the grid square layer as a graph, such as mean elevation or terrain ruggedness (TRI). As our datasets are not yet quite complete, I do not currently have the ability to query these down to subsets based upon archaeological site type / period. 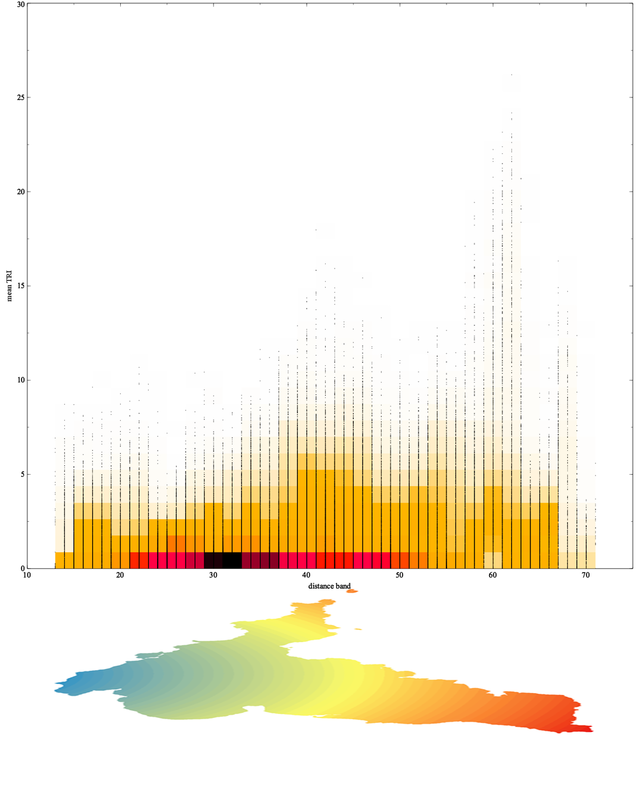 Therefore, I experimented with creating some graphs based upon the entire dataset, thus showing patterns along this SE-NW axis for England as a whole. Graph of mean elevation of grid squares: x-axis = distance band; y-axis = mean elevation. 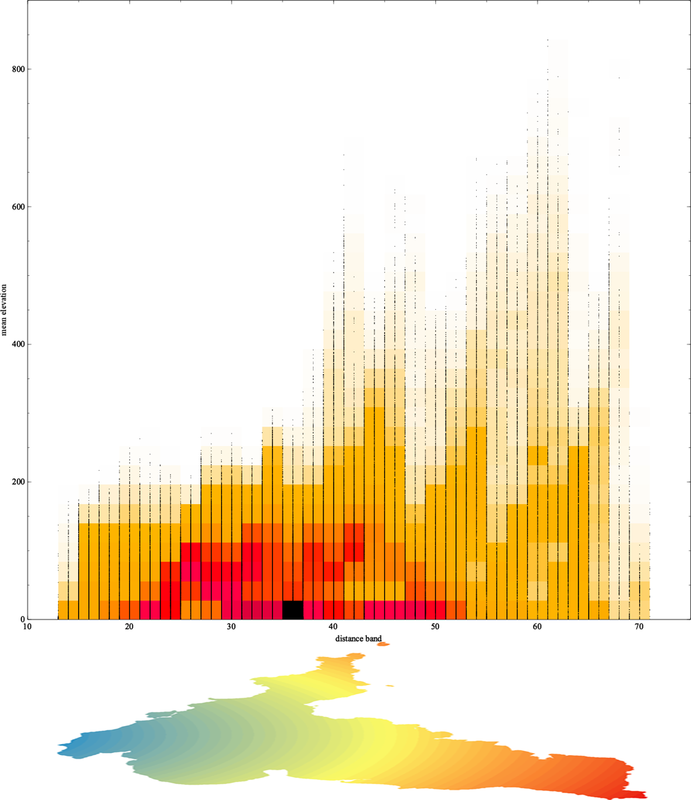 Points are individual data; heat map shows clustering. 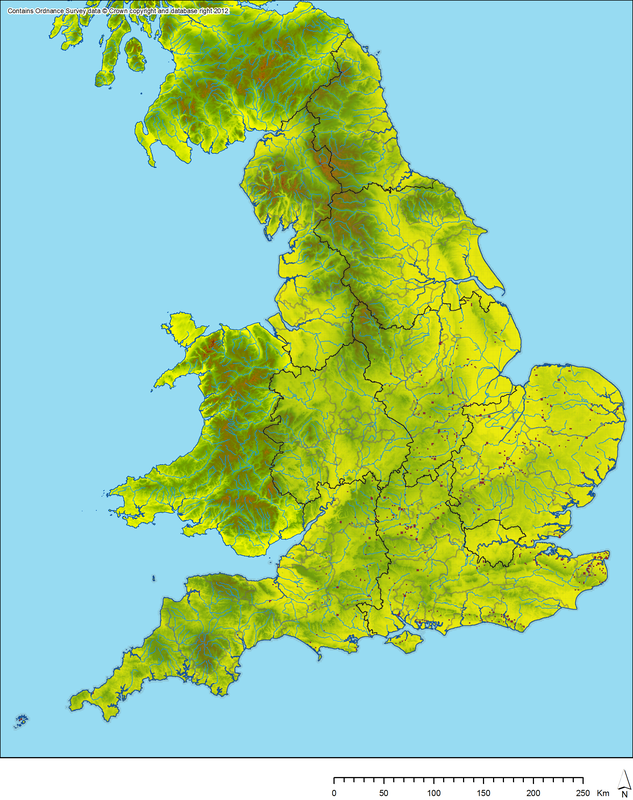 Deformed England below x-axis to show approximate spatial element. Graph of mean TRI of grid squares: x-axis = distance band; y-axis = mean TRI. 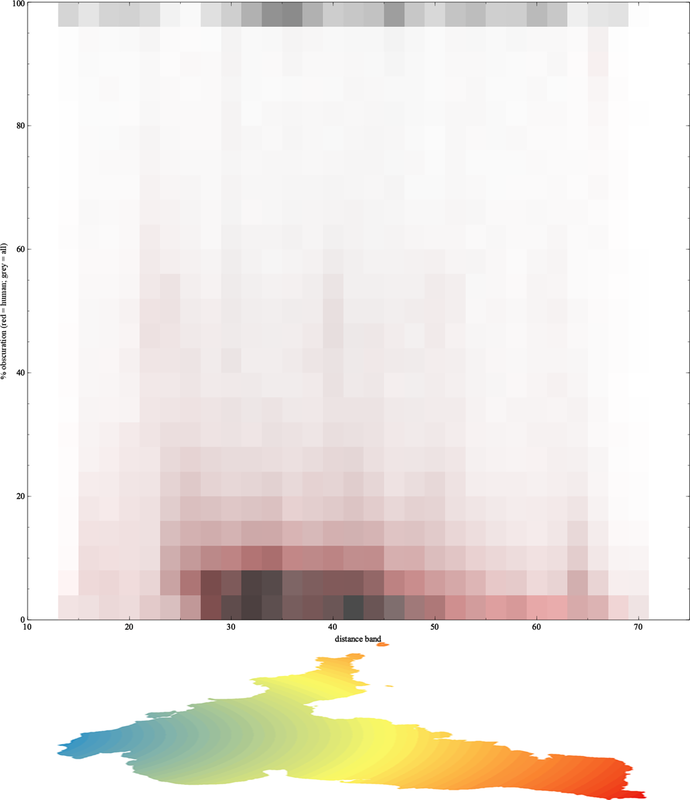 Points are individual data; heat map shows clustering. 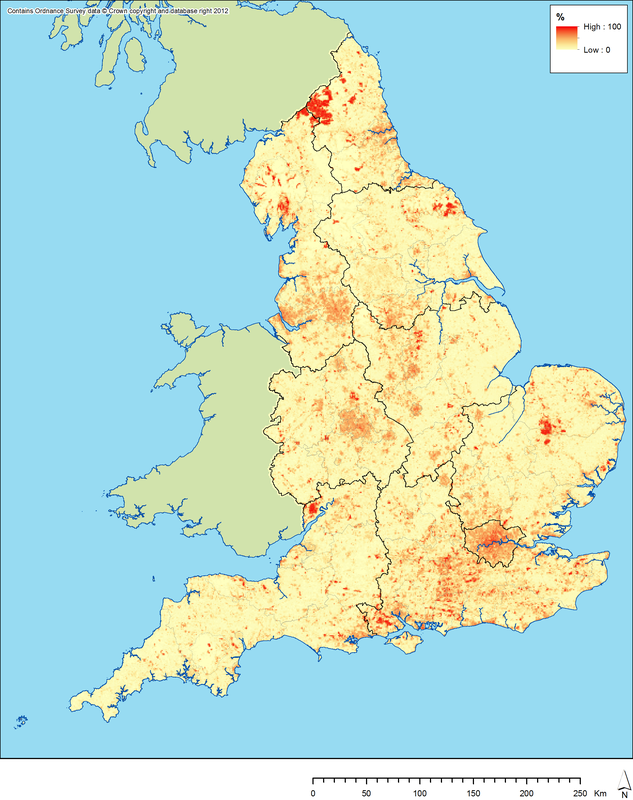 Deformed England below x-axis to show approximate spatial element. These two graphs (created in Veusz from a .csv table exported from ArcGIS) are constructed so that the distance bands run from left (SE) to right (NW), with the mean elevation / TRI being shown on the y-axis (with the TRI, the higher the number, the more rugged the terrain). 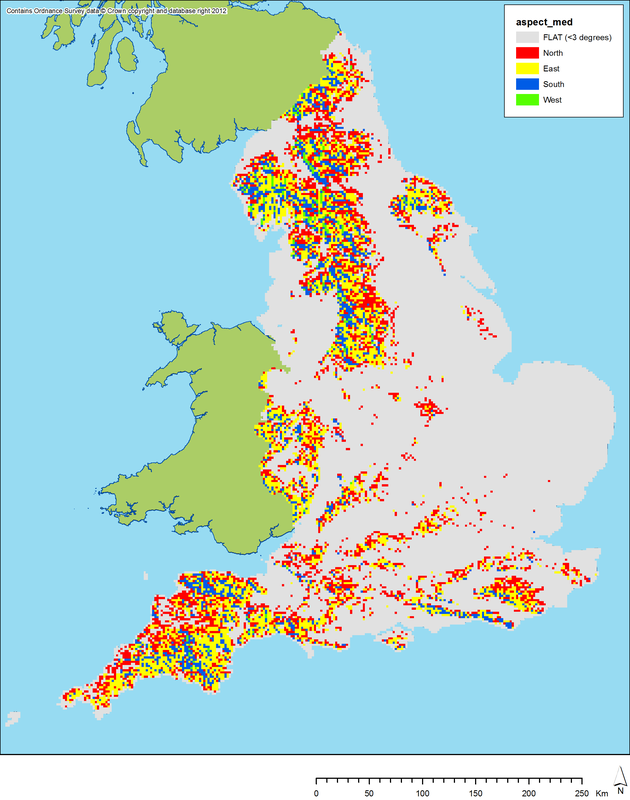 The dots show individual records and the ‘heat map’ behind shows the frequency /clustering of those dots. The deformed England map below each graph is intended to show an approximation of where these bands fall spatially, although obviously this is an imperfect relationship. These graphs both show how the English landscape becomes more elevated / rugged at its extremes as you head north or west from the south east, albeit with its main clustering remaining at fairly low elevations and at fairly low degrees of ruggedness. Graph of percentage obscuration of ground surface of grid squares: x-axis = distance band; y-axis = percentage. The red colouring is for “human” factors; the grey colouring superimposed includes soil / geological obscuration in addition. 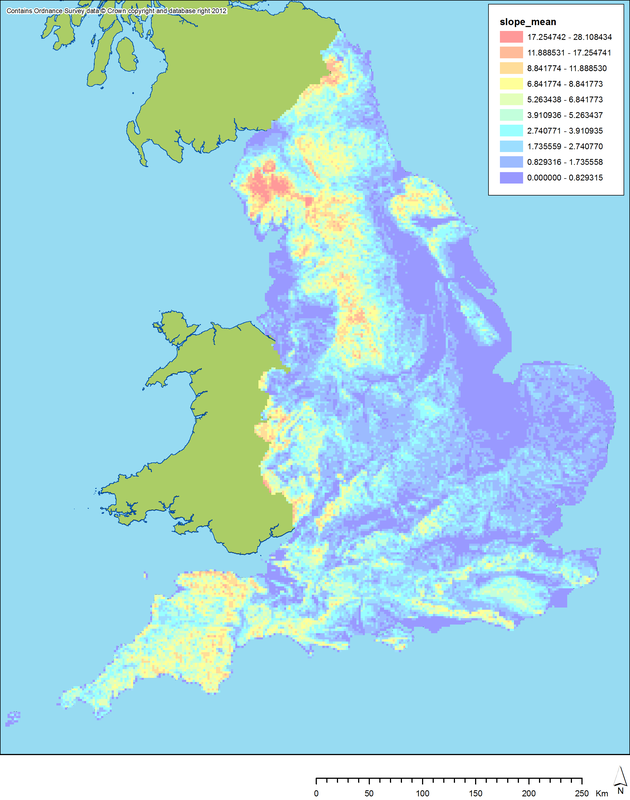 This final graph shows the frequency / clustering of the percentage of grid cells in each band that are obscured from the air for the purposes of aerial photography. 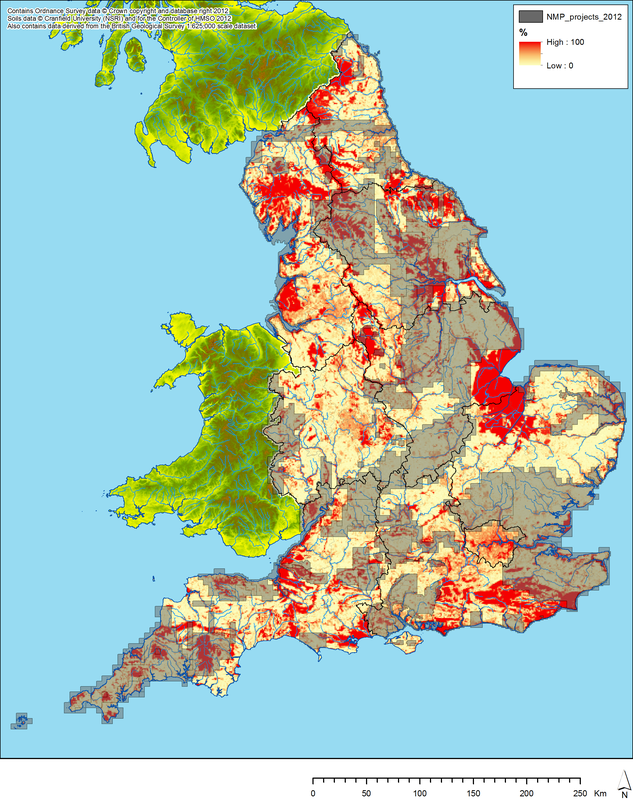 The red shading shows ‘human’ factors only (see previous post), with the greyscale shading also including geological / soil type factors (see this post). This graph is a little harder to read, so probably requires more thought. 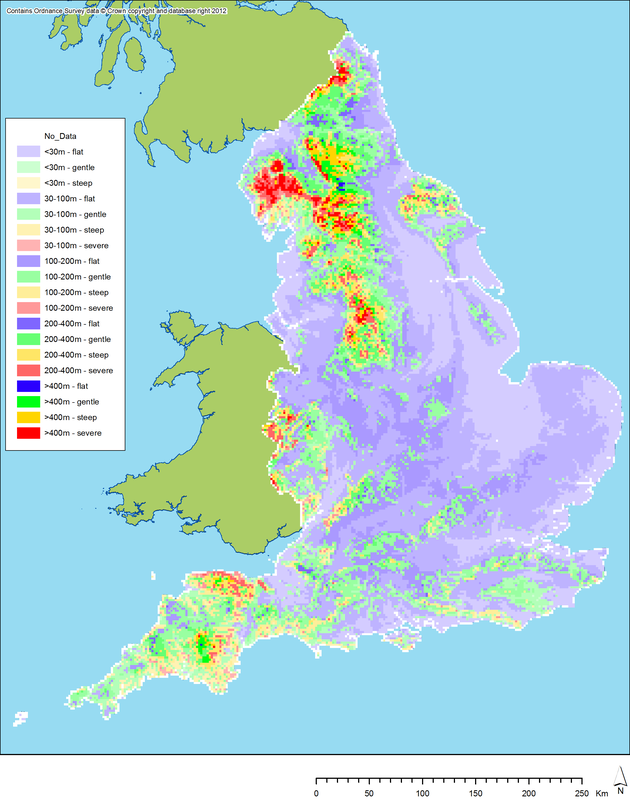 If we compare these three graphs, we can see that the areas of the country most obscured by human activity (which in this instance includes woodland and lakes) cluster in the same bands as the areas of England which are predominantly of low elevation / ruggedness. This suggests that there is a relationship between landscape morphology and human activity (as we would expect), with humans tending to prefer to settle in areas which are arguably easier to live in (i.e. lower, flatter terrain). This is all very experimental at the moment and the conclusions reached are not yet particularly relevant to archaeological study, but it does prove that there is potential for a methodology such as this to elucidate patterns in our data. Once we are able to query down this grid square dataset to only include cells with particular types of archaeological feature in them, we will be able to create many different graphs such as these and, as such, attempt to quantify the difference / similarity in the distributions of different archaeological features, based upon several attributes (i.e. elevation, TRI, ground obscuration). In conclusion, I do think the methodology outlined has potential for studying patterns in our data, but it will require a lot more thought and experimentation to be certain. Roberts, B. and S. Wrathmell. 2000. 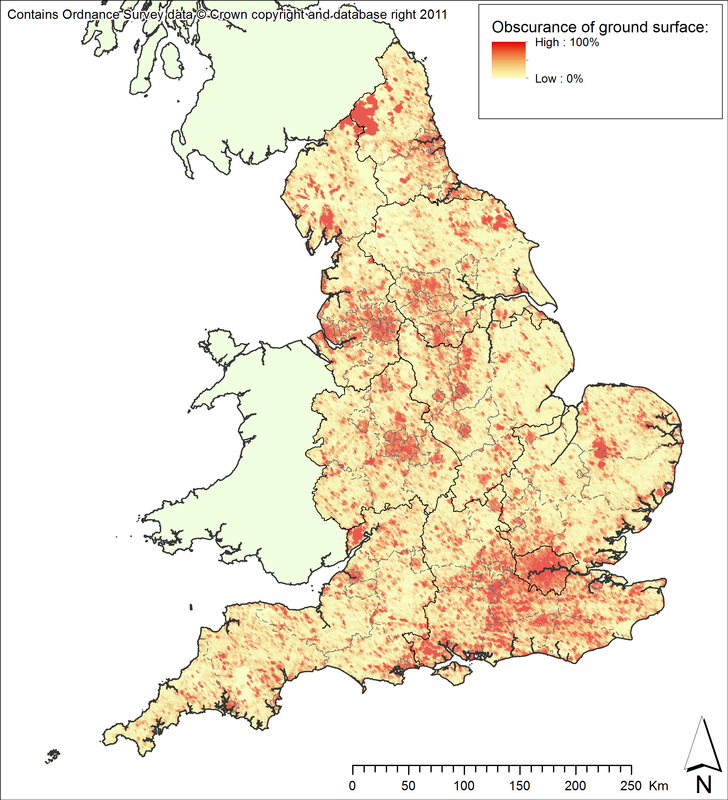 An Atlas of Rural Settlement in England. London: English Heritage. Roberts, B. and S. Wrathmell. 2002. Region and Place. A Study of English Rural Settlement. London: English Heritage. Taylor, J. 2007. Atlas of Roman Rural Settlement. London: English Heritage. I have been thinking some more about measures of landscape morphology and how we might bring together our multiple datasets into a single synthesis. If you compare the values on this TRI map (between 0 and 18.9 metres) against the classification given on the webpage linked above, you would end up classifying all of England as “level”, which seems fairly ridiculous, but this is down to a few obvious factors. First, a 50m cell size is quite small (Riley et al. used 1000 by 1000 m cells), so changes in terrain are going to be relatively small as well: changes in elevation of greater than 900 vertical metres across 50 horizontal metres are presumably only seen in landscapes like the Alps or Yosemite. Second, the DEM was interpolated by the OS from their contour dataset, which inevitably will have resulted in some smoothing of landscape features. Third (and most importantly), I have investigated further since and discovered that the maths / process are not actually correct for Riley’s TRI: when I found the original article of Riley et al. (1999), they are in fact calculating their TRI differently (theirs being the sum of the absolute [i.e. removing any negative sign] difference between a cell and all of its eight neighbours, whereas this result is the square root of the difference between the lowest and highest neighbouring cell value). This is a good lesson to learn (that I should have learnt already) in not trusting random websites found as the result of a Google search! This is not a fixed list and we will undoubtedly continue to refine it over the coming months. The result of applying the thesaurus to a dataset is a new field containing a string of values based on the list above. The values are codes defining a particular period / type of site (sites can have multiple periods / types), e.g. RO04A would be a Roman villa site or IA07A would be an Iron Age hillfort. 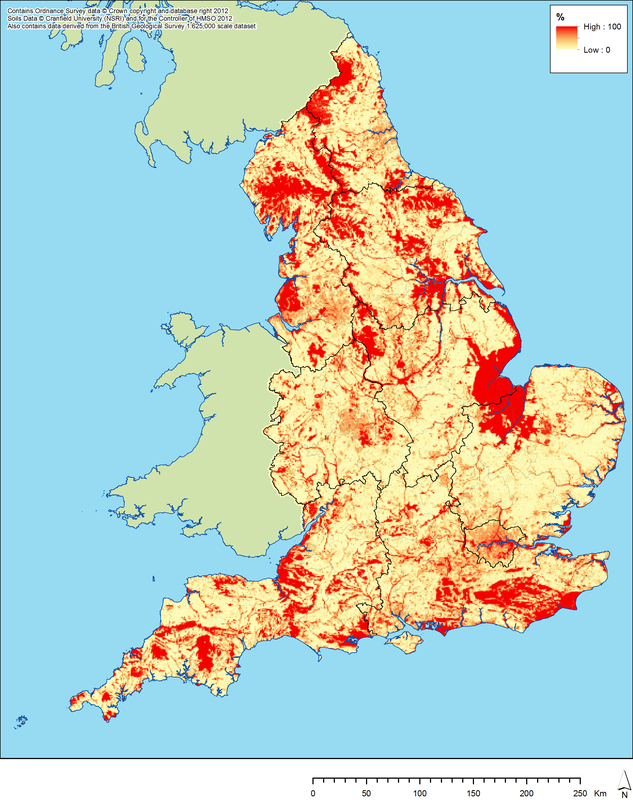 When we then apply a tessellation of grid squares across our input datasets, we can collate results using these codes to remove duplication, resulting in a map showing the presence of each type of site by grid square across England. I have also been looking at different tessellations of grid squares. Until now, I had been using squares of 2 by 2 km dimension, as that seemed a sensible resolution for looking at patterns on the scale of England, but when applying this methodology in my latest tests, I have come to the decision that the resolution is too coarse. This is particularly compounded by the issue that when a data point falls on the intersection between four grid squares, it is registered as falling within all four squares, with the result that some sites have undue prominence in the synthesised dataset. I tried to find a way around this by using two overlapping tessellations with the origin of each cell in set B being at the central point of each cell in set A (as suggested to me at CAA by an audience member), but soon came to realise that merging these two datasets (accepting the presence of a site type only if it was in both overlapping cells) would simply replicate the result of applying a 1 by 1 km grid square tessellation layer. Therefore, to decrease the coarseness of my grid square layer, I have now started using a tessellation of 1 by 1 km grid squares. The results are much more aesthetically pleasing. As a large number of our points will fall on the origins of these squares (where data locations are only known to the nearest kilometre square), I have also offset this new 1 by 1 km grid square layer by 500m east and 500m north. Therefore, these points that fall on the 1000m intervals will only be counted in a single grid square. This does mean that they might be slightly misplaced (by up to 500m east and 500m north) if they fell somewhere towards the northeastern corner of their kilometre square in actuality, but this is a very minor spatial misrepresentation on the scale of all of England. Once the NRHE dataset is complete and once we also bring in the HER data that we are currently gathering for all of England, the distributions plotted will be much more complete, but I think that the result is beginning to show some promise. Bronze Age stone circles (150 results): mean elevation 235.9m ± 116.5m (1σ) (range 0.0 – 471.0m); mean TRI 3.2m ± 0.9m (1σ) (range 0.1 – 5.3m). 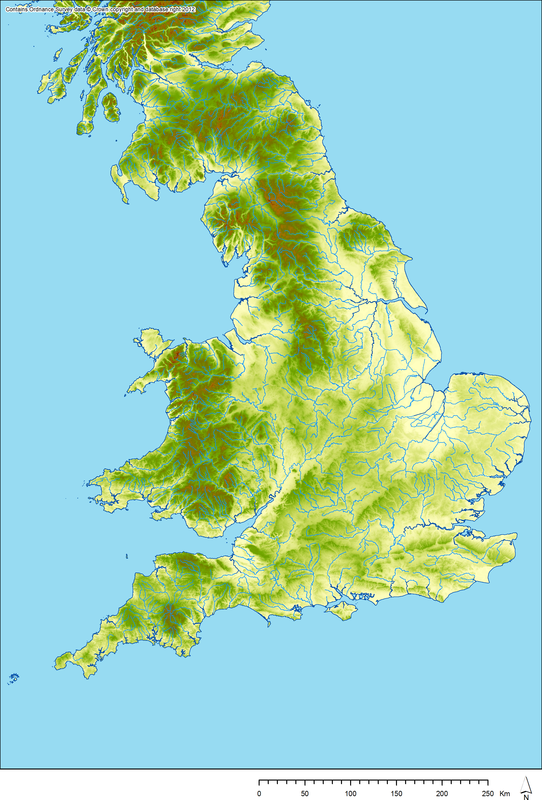 Iron Age hillforts (764 results): mean elevation 116.3m ± 69.5m (1σ) (range 0.0 – 439.6m); mean TRI 3.2m ± 1.1m (1σ) (range 0.0 – 7.6m). Roman villas (2495 results): mean elevation 77.1m ± 53.8m (1σ) (range 0.0 – 360.5m); mean TRI 2.0m ± 0.9m (1σ) (range 0.0 – 6.5m). Early medieval inhumation cemeteries (760 results): mean elevation 60.7m ± 53.8m (1σ) (range 0.0 – 234.0m); mean TRI 1.9m ± 1.0m (1σ) (range 0.1 – 5.4m). As these distributions are incomplete, we should not read too much into these results, but some patterns do seem obvious. Hillforts (and stone circles) tend to be at higher elevations (logically) and on more rugged terrain, but have outliers right down to 0m elevation (these tend to fall along the coasts which are, thus, more likely to be edge effects than genuine 0m OSD hillforts, e.g. where a monument polygon overlaps a grid square with almost nothing but sea in it [I can partly correct for this by clipping my DEM to the coastline at a later date], but one is in northern Cambridgeshire [Stonea Camp]: should such a site really be defined as a “hill” fort?). By contrast, villas and early medieval cemeteries tend towards lower, flatter landscapes. 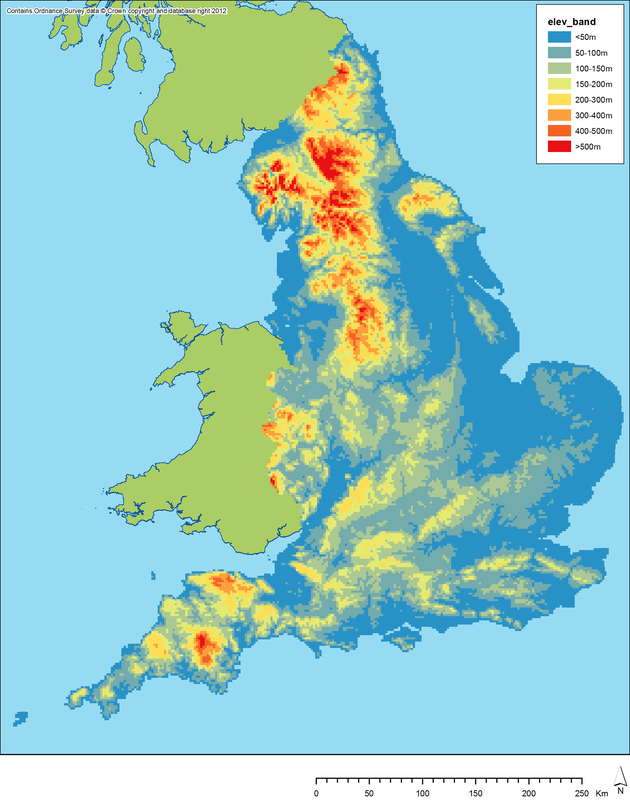 These are generally logical and fairly obvious results that we might expect to see without calculating any statistical measures, but it is still a useful exercise to run these analyses to try to confirm our intuitive assumptions and to attempt to discover any unusual cases that do not match what we might have expected (such as “hillforts” at sea level). When applied more extensively to more complete datasets for each of the thesaurus types defined above and for each period (where types exist in more than one period), we might discover some interesting patterns. Obviously, this methodology remains a work in progress and I will continue to refine it over the coming months as more data comes in. This includes revising our thesaurus as research questions and the nature of our datasets becomes clearer and deciding on a better measure of terrain ruggedness (probably being the GDAL version). We have begun to think about some of the different variables that we will want to compare our distributions against once we reach the stage of analysing data for our national survey. One of these variables will probably be the morphology of the landscape itself. There is a fear in archaeology these days of being accused of “environmental determinism”, but this fear sometimes means that we ignore environmental variables that do have an impact on past human choices: Chris Gosden, our boss, suggested today that this was denying landscape its own agency. As such, we do believe that this is a legitimate set of variables to take into consideration when studying distributions of archaeological sites. 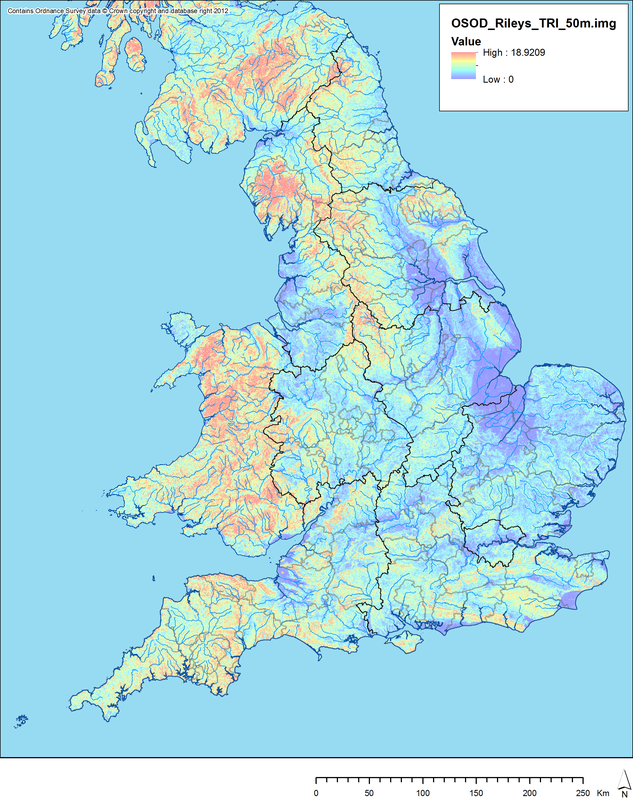 We can plot and derive various morphological variables when we have an elevation model of England to hand. Fortunately, again the OS OpenData can provide here: it includes a Digital Elevation Model (DEM) of the British Isles at a pixel resolution of 50 x 50 metres (interpolated, I believe, from contour mapping). This is more than sufficiently detailed for nationwide or regional studies (a higher resolution DEM would be preferable for more focused scales of study). The DEM provides elevation data, which is the first characteristic to be studied. From the DEM, we can also derive two further morphological variables using standard tools within ArcGIS: aspect and slope. Aspect shows the predominant compass direction in which a cell is pointing. Slope shows the degree (or percent) of slope of each cell, as you might very well guess. These three variables are all at a 50m pixel resolution, but for our national survey we will be studying distributions at a 2000m pixel resolution. Therefore, we need to consider: (a) whether there is any validity to studying these variables at this coarse resolution; and (b) how to generalise the data from 50m cells to 2000m cells. Elevation is fairly non-controversial as elevation varies quite predictably across the landscape in most cases. Therefore, we can simply use the mean average elevation as an expression of the approximate elevation of each cell. Slope is more problematic, as slope can vary a great deal within a 2 by 2 km area. However, it does serve well as a type of proxy for the general “bumpiness” of a cell. It is important to consider this in addition to elevation, as it helps distinguish between more flat (i.e. plateau) and more “bumpy” (i.e. mountain) uplands, more on which below. Aspect is much more difficult to generalise, however: I will present the results below, but I am unconvinced that they have any great validity. As should be apparent, this result is a rather messy and problematic one. The dominance of northerly and easterly aspects seems incorrect, and the overall pattern seems too incoherent to be convincing. As such, I don’t believe that there is any great feasibility of using aspect for this scale of survey. However, it may prove more fruitful when approached at the case study level during the latter part of this project. Ignore the white cells around the edges of England on this map, that was my error in forgetting at which stage in the process I should clip the results to England. 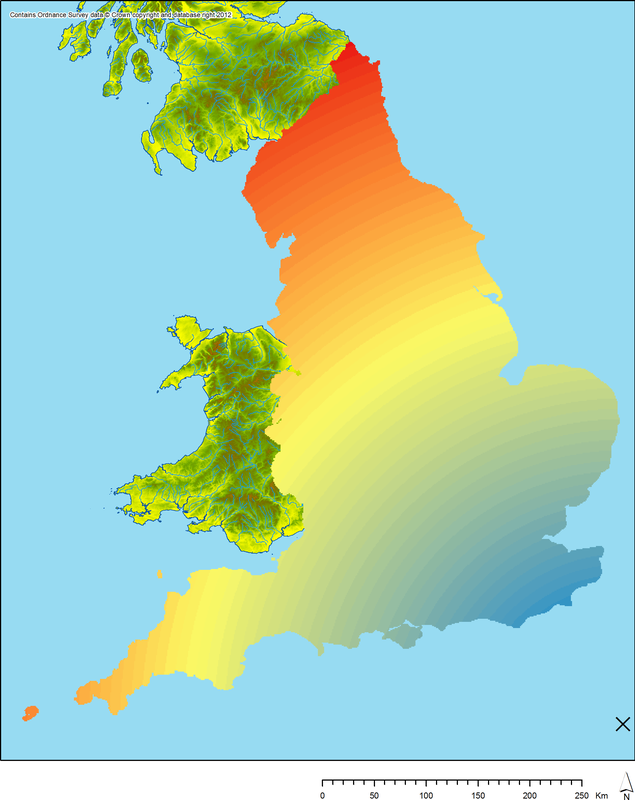 On this map, slope is represented by colour (purple/blue = flat; green = gentle; yellow = steep; red = severe) and elevation by saturation (i.e. the brighter the colour, the greater the elevation). This shows how you can use the HSV colour space to display two variables at once, albeit with slightly difficult results to read. However, I do think it is possible to derive certain conclusions from visual examination of this map: in particular, I like the way in which you can see a strong difference between landscapes that are truly mountainous (such as the Lake District and parts of the Pennines) and landscapes that are more plateau-like in character (such as Bodmin Moor and Dartmoor and other parts of the Pennines). Of course, whereas visual examination of this map is quite difficult, it would be simple to derive statistical measures from it. In conclusion, then, I believe that there is strong potential for comparing archaeological distributions on the scale of England against certain aspects of landscape morphology. Certainly elevation, probably slope (especially in combination with elevation), but probably not aspect. I may continue to try to produce a more useful result for aspect, however, but I don’t think the prospects are particularly strong. We can then export these selected features to a new layer, which is the basis of our major watercourses layer. There is one small difficulty that arises in that many small sections of interlinking watercourses do not appear to be named in Meridian 2. 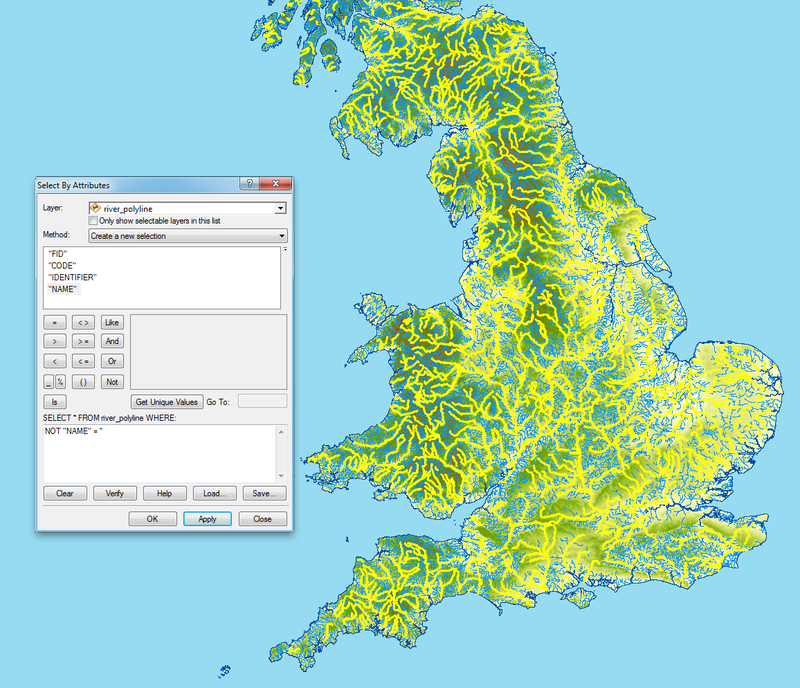 I therefore spent a couple of hours working through the new layer and drawing these back in using the edit tools in ArcGIS, based upon the data in the original layer, in order to produce a map that looked more like a proper river network. I also deleted some of the straight watercourses left in The Fens where they clearly did not take the place of previous natural watercourses. I only did this cleaning task for England (due to the remit of our project), but it would not take long to do for the country as a whole. 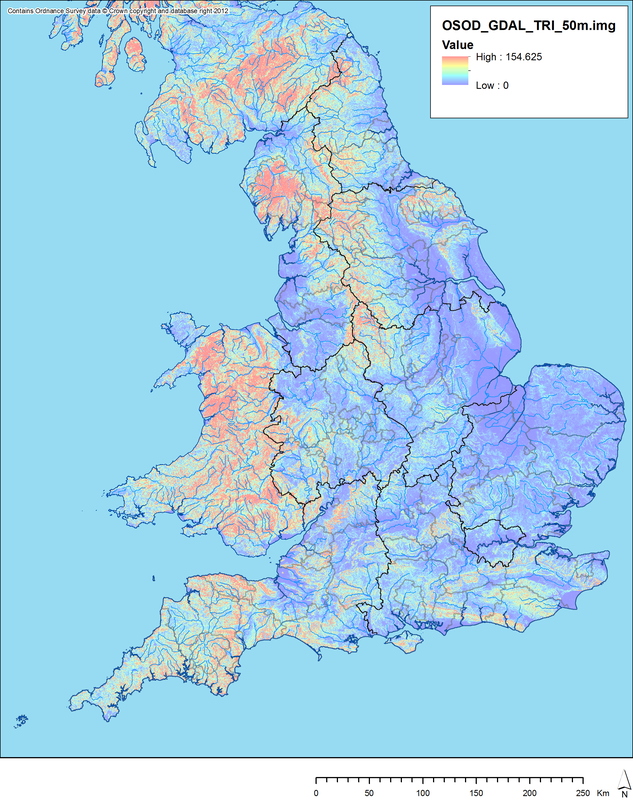 Incidentally, some of these gaps were caused by there being reservoirs along the course of the rivers in question, which could easily be plotted on the map using the relevant Meridian 2 layer*: these were not plotted for our purposes due to being modern features. 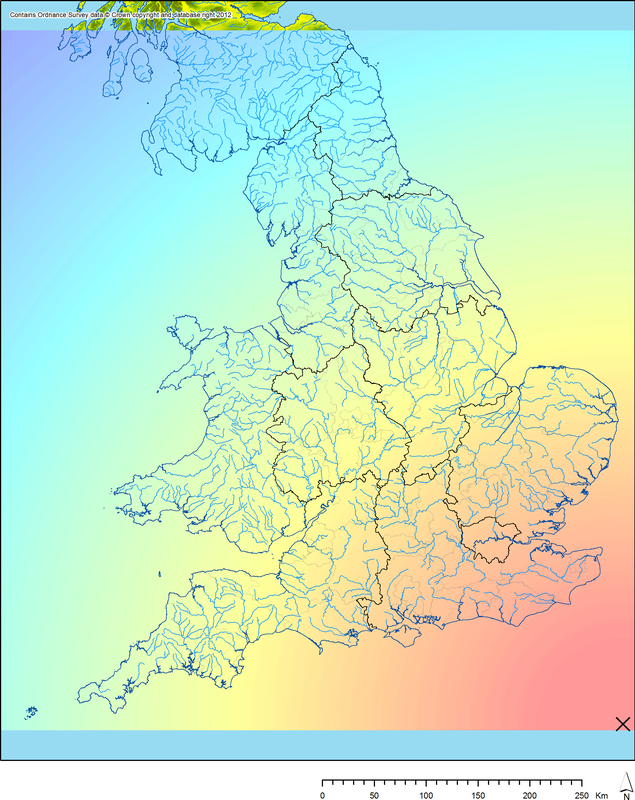 * A process similar to this would not work as well for the lakes / reservoirs layer in Meridian 2, simply due to the fact that most reservoirs are not called “Something Reservoir”, but given more bucolic names like “Draycote Water”. As such, it would be much harder to extract these modern features from the dataset than it was with canals.